We’ve reached out to three popular bloggers to share some easy, delicious and not-your-Bubby’s-style hamantaschen. If I was going to make a savory hamantashen, I knew that mine would have to include pastrami. Now that the filling was all set, I had to work around that. I took inspiration from the flavors inside deli rolls and sandwiches, but one upped it by frying these guys until they were golden crispy. Of course, you can bake them. I tried that too. 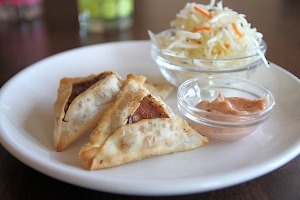 Serve these with coleslaw and Russian dressing to round out the meal. Heat oil in a sauté pan over medium heat. Add onion and sauté until extra soft and golden, about 10 minutes. Add pastrami and sauté for 1 to 2 additional minutes. Stir in mayonnaise, ketchup, honey, hot sauce, and soy sauce. Place 1 teaspoon filling in the middle of each wrapper. Brush cornstarch mixture around the edges (this will help seal the hamantashen). Fold into hamantashen shape. To bake the hamantashen, preheat oven to 400oF. Place hamantashen on a lined baking sheet and spray the tops with nonstick cooking spray. Bake for 8 to 10 minutes. Alternatively, you can fry the hamantashen (of course, it’s much tastier this way and that’s the version I prefer). Heat 1 inch oil in a sauté pan over medium-high heat. When hot, add hamantashen and fry until golden and crispy, about 3 to 4 minutes per side. Keeping with the traditional shape, I mixed it up in the kitch by using new flavors. I like chocolate and savory foods, so I came up with the following three versions that were in the spirit of the holiday but tastier than the usual selection. I am not a baker and the idea of making my own dough seems tiresome. I use ready-made dough such as puff pastry and wonton wrappers, creating easy and tasty hamentaschen. These chocolate and raspberry filled pastries are decadent. The first time I baked them, the raspberry juices leaking out during the baking process leaving them to resemble bleeding hearts (which worked for me since my family dressed up as pirates.) This year, I dusted the raspberries in some flour before placing them in the chocolate, and they did not leak. Either way, they taste divine! Cut out circles of puff pastry using a cookie cutter or the rim of a glass cup. Wet the dough with some water, then place 1 tsp. of chocolate sauce in the center of each circle. 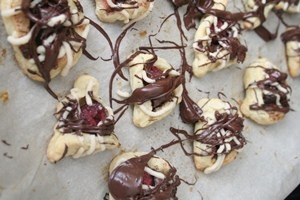 Place 1 or 2 raspberries on top of chocolate then pinch the side of the dough together forming a triangle. If you have trouble getting it to stick, wet it with more water. This will help it stick together. Bake in oven on 375oF for 15 to 20 minutes until golden and slightly crispy. Melt the chocolate chips and drizzle over hamentaschen. These taste great once cooled off and given the chance to slightly harden, otherwise it’s a gooey mess! Brown beef, then add taco seasoning. Cook for an additional 10-15 minutes. While the meat cooks, cut out circles of dough if using wonton wrappers and place onto slightly greased baking sheet. (If you are using ravioli dough that is pre-cut into circles, place them on a slightly greased baking sheet.) Wet the dough with some water then place 1 tsp. of taco meat filling in center of each ravioli circle. Pinch the sides together, forming a triangle. If it won’t stick together, wet it again, this helps it stick together. Bake in oven on 350oF for 10 to 15 minutes until golden and slightly crispy. 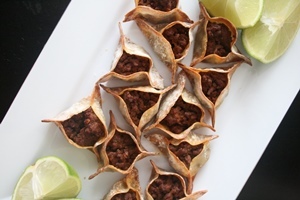 Serve them with all of your favorite taco toppings such as guacamole, salsa and shredded cabbage. Caramelized onions, tomato, basil and goat cheese make these the perfect appetizer to serve this holiday. I had to resist eating all of them long enough to take the photo! 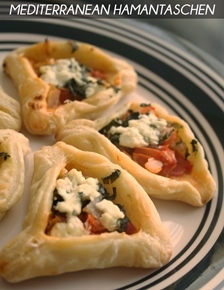 Cut out circles of puff pastry using a cookie cutter or the rim of a glass cup. Sauté the onions until tender. Add the tomatoes and cook for several minutes. Wet the circles of dough with an egg wash, which is 1 egg + 1 tablespoon of water. Then, place 1 tsp of tomato onion filling in center of each circle. Top with some goat cheese and basil. Pinch the sides together, forming a triangle. You might need to wet it with some of the egg wash to get it to stick. I had to sort of fold the edges over slightly, to keep it from opening up. Bake in oven on 375o for 15 to 20 minutes until golden and slightly crispy. A reader e-mailed me and asked me to please post a recipe for hamantaschen with homemade fillings. Now, there is a slight problem with that. I really don’t like hamantaschen. There’s something so hamantaschey about them- you know what I mean? Granted, if I am in a car with three hyperactive, sugar crazed monkeys, and I skipped lunch so I am starving, and you stick a cellophane wrapped plate of hamantaschen under my nose, I probably would devour them. But I wouldn’t enjoy them all that much. And I might eat a smashed cupcake first. Just sayin’. So this reader got me thinking—how can I post a hamentaschen recipe that I actually like? So basically, I did just that- I took my favorite sugar cookie recipe, and my favorite brownie recipe and they had a baby! Then I felt a little bad, because she really did ask for a homemade filling recipe, and most normal people on this earth probably do not classify brownies as a normal hamantasch filling, so behold my next brainchild: Appie Pie Hamantaschen. Cream together the butter/margarine and sugar until smooth. Beat in the eggs, vanilla and lemon juice, scraping sides occasionally. Reduce mixer speed to low, and stir in flour, baking powder and salt. Cover and chill dough for at least one hour (don’t skip this step!) or overnight. Preheat oven to 350°. Melt butter/margarine in a medium sized saucepan. Remove from flame and allow to cool slightly. Add in sugar, eggs and vanilla and stir (by hand) until smooth. Stir in cocoa, flour, salt and baking powder. Pour into a greased 9×13 pan. Bake at 350° for 35-40 minutes. Keep in mind that since these brownies will be used as a filling, they do not have to be perfectly ready—in fact, its easier to fill the hamantaschen if they are slightly under-cooked. To assemble: Preheat oven to 400°. Lightly flour your work surface. Roll out cookie dough to the same thickness as you would for sugar cookies, or slightly thicker. Be careful not to roll the dough out too thin- or you will get holes in the hamantasch as you fold it. Fold the bottom side up and pinch lightly. Line a baking sheet with parchment paper or a silicon mat. Arrange formed hamantaschen on the pan. 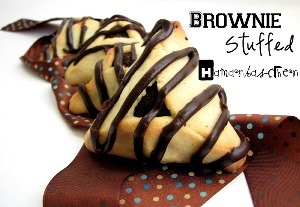 Drizzle cooled hamantaschen with Basic Chocolate Glaze. Combine all filling ingredients in a small bowl-mix well. Lightly flour your work surface. Roll dough out to the same thickness as sugar cookies, or slightly thicker. Place a very small spoonful of apple filling in the center of the circle. (If the hamantaschen are overfilled, they run the risk of popping open during baking.) Towards the end of the batch of hamantaschen, I found that the apples got very liquidy, so squeeze out any excess liquid before placing it on the circle. Smear some egg white around the edge. Press the top two edges together and pinch lightly. Arrange on a lined cookie sheet. Bake in a preheated oven at 400° for 15 minutes. For the glaze: Pour 1 1/2 cups powder sugar into a ziploc bag. Add 2 tablespoons milk or creamer and 1/2 teaspoon vanilla. Zip close and mix. The glaze will probably be thick- if it is, microwave on high for 15 seconds, and mix again. (You realize when I say mix, I mean squish, right?) Snip off a corner and drizzle over cooled hamantaschen. Nechama Fiddle runs a popular baking blog called CantStopBaking. She seamlessly combines her passion for baking and photography on her blog. Check out some of her latest escapades and creations. Can’t get enough of this fun and delicious Hamentaschen recipes? 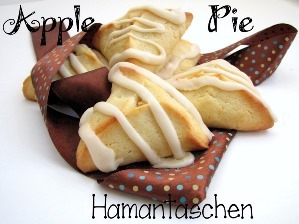 Check out Hamentaschen: New Twists on a Holiday Classic – Part II!